I Love You More Than Carrots: The Disparities of Hubs and Wifey. Growing up, I always had dessert after dinner. It was one of the perks of clearing your plate and finishing whatever vegetable managed to sneak its way next to your pork chop/chicken/filet. And more times than not, dessert was synonymous with ice cream. A big giant cereal bowl filled with mint chocolate chip ice cream topped with Hershey's chocolate syrup. Mmm. Delish. Growing up, for Hubs, was a little different. A typical post-dinner dessert often consisted of fresh sourdough bread heaped with natural peanut butter. Don't get me wrong, this, too, is delish, however it's not the first thing I yearn for after dinner. Even, 26 years later. Needless to say, I've been dying to try the tiny homemade ice cream shop down around the corner ever since I first discovered it almost four weeks ago. After a few unsuccessful attempts, I finally managed to coerce Hubs to take me for ice cream. I'm sure it had something to do with my seductive wifely ways, or the fact that I promised him we could stop by the beer store on the way home. And thus, I've decided that not only can the world be divided into two types of people, dog people and cat people, but I've also discovered that the world can be further broken down into two additional and distinct groups of people.. Sugar cone people and Cake cone people. Hubs is a sugar cone kinda guy. I loathe sugar cones, much like I detest the waffle cone. It's too.. serious. I, however, drool at the thought of a fresh cake cone. It makes me think of my childhood. 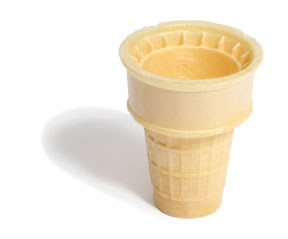 Plus, it's undoubtedly the better cone. I'm definitely a sugar cone kinda girl! I was raised on them....soooo good. But I would never turn down a cake cone if it was offered! I'm with you...cake cones are far superior....also they don't drip ice cream from the tiny hole in the bottom like the sugar cones! I totally agree!! I LOVE cake cones! When I was a kid, sometimes I would go to Carvel with a friend's family. But I am an ice cream snob and don't like Carvel. So I would just get a cake cone. And I was perfectly happy. I do not at all understand the draw to waffle cones. Who needs a gallon of ice cream in your hand at one time. 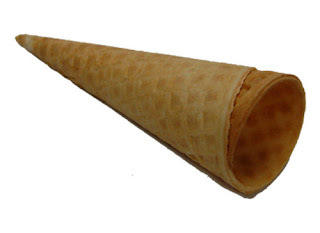 I would throw it away before eating the cone. So what would be the point?! oooh, there is nothing better than an ice cream cone after dinner! I'm totally on your side! I do like the crunchiness of a waffle cone a little better than the others, though! I like mine in a cup, what does that say about me? lol...do I even want to know? Did you get your package yet?! I'm hoping the mailman didn't steal it!! Sugar cone. All the way. Yum. Ha ha you're so funny. I love the sugar cones! So good! I'm definitely a sugar cone person! I don't like cake cones at all...I just don't think they taste very good! Perhaps I might offer a dessert compromise compliments of my little sister who loves icecream but who also loves sourdough toast for a post dinner treat. Put the other piece of toast on top of that. Sour, sweet, a tad greasy, hot, cold, crispy, and mushy- it satisfies every palate. I have to side with Mike on the cone thing though. But I definitely love YOU more! happy summer!